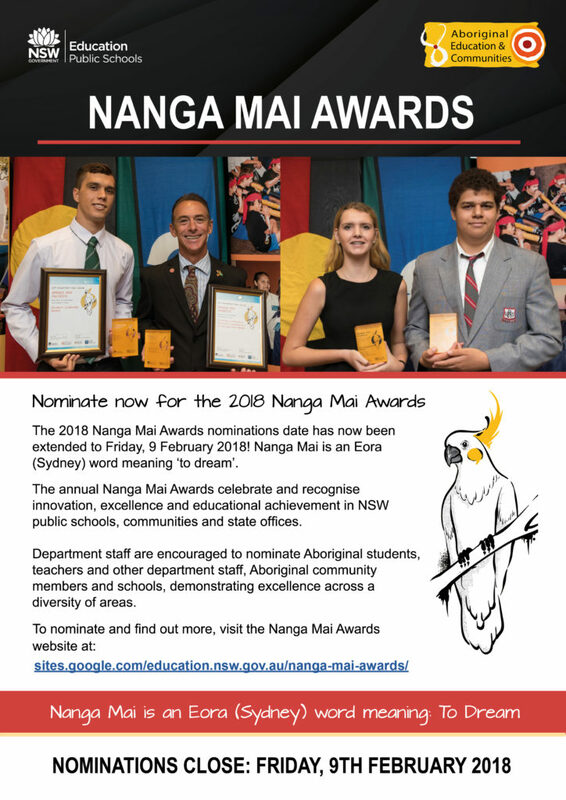 Nominations for the 2018 Nanga Mai Awards have now been extended! The 2018 Nanga Mai Awards nominations date has now been extended to Friday, 9 February 2018! Nanga Mai is an Eora (Sydney) word meaning ‘to dream’. The Nanga Mai Awards celebrate and recognise innovation, excellence and educational achievement in NSW public schools, communities and state offices. Department staff are encouraged to nominate Aboriginal students, teachers and other department staff, Aboriginal community members and schools, demonstrating excellence across a diversity of areas. Please visit the Nanga Mai Awards website for more information.